Earth Day is April 22 (tomorrow!). How should you celebrate Mother Earth? You could adopt a road and recruit friends to help you keep it free of litter, take old documents and other materials to one of the recycling events being held around town, or really make it a great day by buying a brand new all-electric Tesla P100D (if you do, I’d like a ride). What all these materials share in common is that they are toxic, corrosive, and/or can catch fire, react, or explode under certain circumstances. Yikes! Products like these contain hazardous ingredients and require special care pretty much from the first moment they come into your hands. 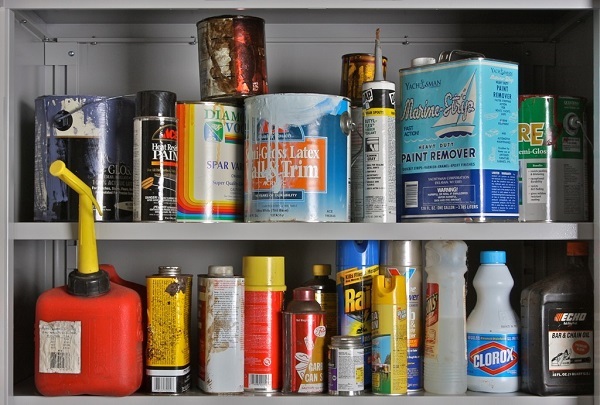 It’s important to exercise caution when you use, store, and dispose of household hazardous waste (HHW). If disposed of incorrectly, it can be toxic to wildlife and the environment. As always, be sure to reduce, reuse, and recycle hazardous waste, in that order. Reduce: Can you avoid buying it (or as much of it) in the first place? To reduce your consumption of HHW, consider buying more environmentally friendly products, making your own with natural ingredients, or buying a limited quantity of the product when you need it and sharing it with a neighbor. Reuse: Can you get some more use out of it or find a friend, charity, or business that can? Recycle: If neither reducing nor reusing is an option, and it’s time to get rid of the waste, then dispose of it properly. Here’s how to safely dispose of some of the most common categories of household hazardous waste in Gwinnett County. Latex and water-based paints are less toxic than oil-based paints. To dispose of latex paint yourself, solidify it first. Mix the leftover paint with an absorbent material such as cat litter (even used litter! ), sawdust, or shredded newspaper to absorb all liquids. Allow the mixture to harden. Once the paint has completely solidified, it may be placed, double-bagged, with your household garbage. To properly dispose of spray paint in aerosol cans, take a plastic garbage bag and hold the can inside the bag, with your other hand holding the bag closed around your wrist (be sure to wear gloves). Spray the can of paint into the bag until it is empty. Then open the bag outside and add an absorbent material, mixing the paint with the material. Let the mixture dry for a few hours, adding more absorbent material until there is no liquid left. Once the mixture is completely solid, put the bag into another bag and throw it away. The empty can can be recycled with scrap metal. To dispose of leftover oil-based paint, or to let someone else handle disposing of your latex or spray paint, take it to Atlanta’s Center for Hard to Recycle Materials or a paint recycling event hosted by Gwinnett County or a local city or school. Note that a small disposal fee — a few dollars — may apply. To recycle automobile fluids, such as motor oil, antifreeze, transmission fluid, or power steering fluid, call ahead to your local auto parts shop, such as Advanced Auto Parts, AutoZone, Pep Boys, or NAPA Auto Parts. Many of these stores, as well as auto maintenance and repair shops, gladly accept automobile fluids for recycling. Disposing of any household hazardous waste product is well worth the trouble, but auto fluids are especially toxic. According to the EPA, used oil from one oil change can contaminate one million gallons of fresh water. It’s slow to degrade in the environment and sticks to everything from beach sand to bird feathers. Dispose of it responsibly every time, and report any illegal dumping into a storm drain or waterway to the Gwinnett County Department of Water Resources Stormwater Management’s 24-hour hotline at 678-376-7193. Car batteries, which contain deadly toxins such as lead and sulfuric acid, are legally prohibited from disposal in Georgia landfills. To be properly discarded, they must be taken to a Batteries Plus store or an automotive retailer that accepts them. Call ahead to your local store before bringing in your battery for recycling. To dispose of thin, flammable liquids such as gasoline and paint thinner, evaporation is the safest method. Work outside, away from access by children and animals, and wearing gloves and eye protection. If there is just a trace amount of fuel in the container, simply open the top and let it evaporate. If you have more than a very little bit, you may want to accelerate the process. Get some sort of disposable metal tray, such as an aluminum foil roasting pan, and pour a half-inch of fuel into the tray. The increased surface area will allow the fuel to evaporate much more quickly. Repeat this process until the fuel is gone. To dispose of the container and tray, wrap them in a few layers of newspaper, put them in a sturdy plastic garbage bag, and dispose of them in your regular household trash. To dispose of pesticides, follow the instructions on the original container. Never pour pesticides down the sink, toilet, sewer, or street drain — many municipal drinking water and wastewater treatment systems are not equipped to remove all pesticides. To clean a container that has been emptied of pesticides, triple-rinse it outdoors in an area that does not drain to a sewer and allow it to dry completely. Pierce holes in the side and bottom to make the container unusable, and throw it away in household trash. To dispose of dry pesticides or fertilizers, triple-bag them in heavy-duty plastic garbage bags and throw them away. Finally, how about disposing of household chemicals, such as disinfectants and furniture polish? The easiest way, if you will be going into Atlanta anytime soon, is to take them to the Center for Hard to Recycle Materials, which recycles a certain quantity of household chemicals for free and then for a small fee for additional gallons or pounds. If you plan to dispose of them yourself, the proper disposal method depends on the chemical. In Gwinnett County, cleaning chemicals such as bleaches and disinfectants can be flushed down the drain with running water. Flammable and/or toxic cleaners, such as furniture polish and oven cleaner, must be solidified, double-bagged, and then thrown away. Empty containers of household chemicals can generally be recycled curbside. Empty aerosol cans may be recycled, as well as plastic bottles that are triple-rinsed. When it comes to household hazardous waste, the most environmentally-friendly approach is to 1. Reduce, 2. Reuse, and once empty (or if you really can’t use up all the product), 3. Recycle. I am looking to dispose of old roadside flares. Could you make a recommendation? I called the Gwinnett Fire Dept., but they don’t dispose of them. Hi Steven, good question! I did a lot of digging but unfortunately came up empty. Have you tried contacting the manufacturer for their recommended method of safe disposal?